High quality test equipment (TE) typically costs more than the knockoff stuff, but a lot more of the former is still around in regular use compared to the latter. The retained value of vintage TE can be quantitatively measured on eBay - as can most things for that matter. An item is worth what the market will bear. 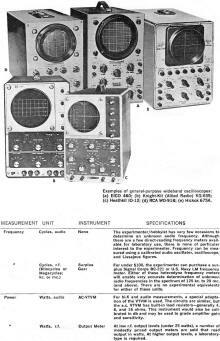 Hewlett Packard (HP), Tektronix, Bird, Simpson, B&K, Triplett, even Heathkit, typically sell for often surprisingly high prices when in working order. Accordingly, a lot of people are looking for specifications on the older equipment as well as schematics and alignment manuals. A Google search almost always turns up what you want. 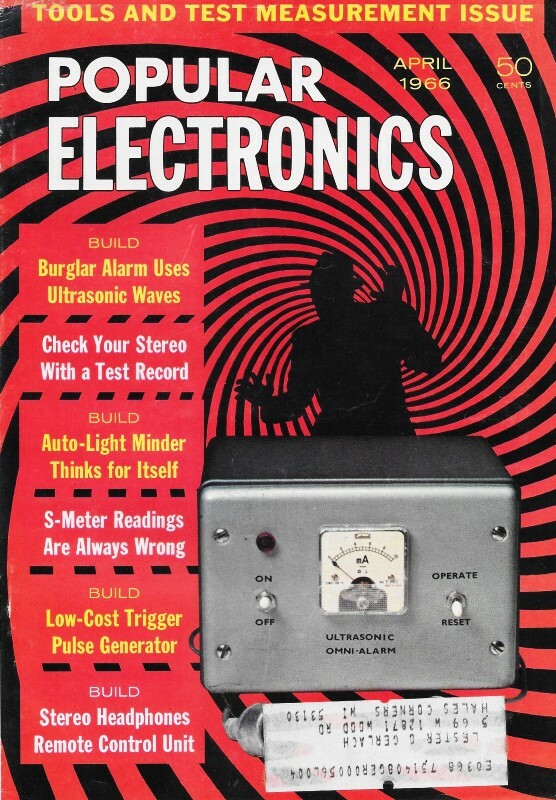 The information presented in this 1966 article from Popular Electronics will probably be found by someone doing just such a search. Incidentally, a couple months ago I found a Hewlett Packard model 5212A Electronic Counter (c1965) buried in a pile of electronics in a second-hand shop. The nice lady at the counter let me plug it in to determine whether it would even turn on. It did, and I paid her the $5 asking price - no haggling. Some spit and polish will have it looking good, and hopefully it will actually function. If not, the innards consist of a handful of plug-in PCB's with discrete components and should therefore be repairable. According to the info I've found, it works up to 300 kHz. It'll be a fun project once I get time to work on it. Anyone out there looking for an HP 5212A Electronic Counter? The reliability of your test measurements can never exceed the accuracy of the instrument used. The experimenter/hobbyist arbitrarily limits his "adventures" into building and designing electronic equipment if he limits the usefulness of his test equipment. 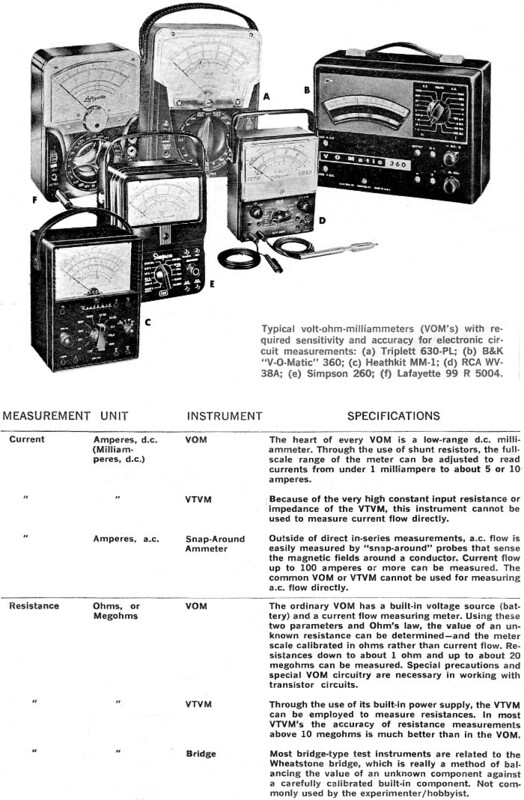 Every reader probably has either a VOM or VTVM, but even these versatile pieces of test gear will not do everything. 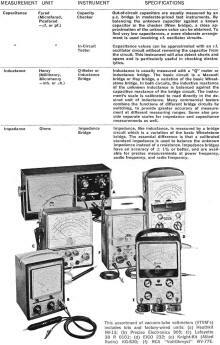 Rather than reiterate the desirable functions of various pieces of test equipment, this article tells you how you can most conveniently measure anyone of eight basic electronic properties: voltage, current, resistance, capacitance, inductance, impedance, power, and frequency. Knowing how to select the right piece of equipment to do a specific job is half the battle. No attempt is made in this article to tell you what equipment - or whose equipment - to buy, nor in specific detail just how a measurement should be made. The latter information is contained in the operational manual that comes with every good piece of test equipment, and you'll be better able to decide what to buy when you have an insight on test equipment in general. 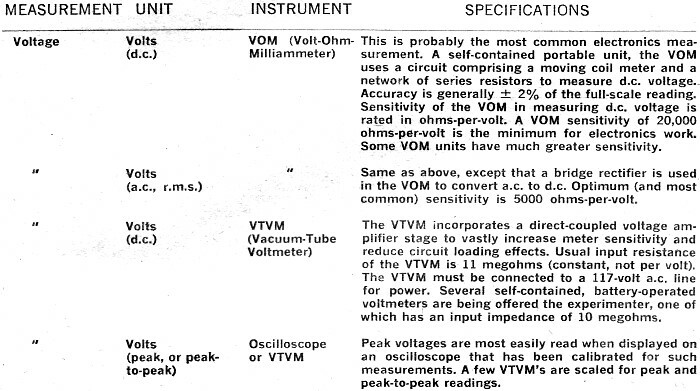 Typical volt-ohm-milliammeters (VOM's) with required sensitivity and accuracy for electronic circuit measurements: (a) Triplett 630-PL; (b) B&K "V-O-Matic" 360; (c) Heathkit MM-1; (d) RCA WV-38A; (e) Simpson 260; (f) Lafayette 99 R 5004. 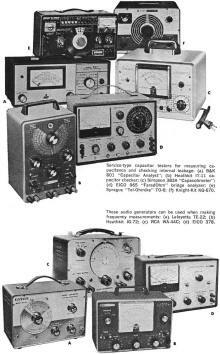 This assortment of vacuum-tube voltmeters (VTVM's) includes kits and factory-wired units: (a) Heathkit IM-13; (b) Precise Electronics 905; (c) Lafayette 38 R 0101; (d) EICO 232; (e) Knight-Kit (Allied Radio) KG-620; (f) RCA "VoltOhmyst" WV-77E. 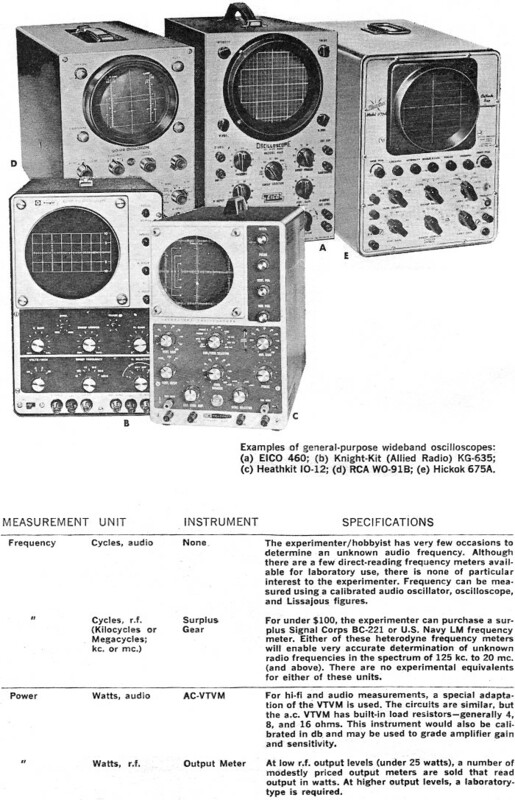 Examples of general-purpose wideband oscilloscopes: (a) EICO 460; (b) Knight-Kit (Allied Radio) KG-635; (c) Heathkit IO-12; (d) RCA WO-91B; (e) Hickok 675A. Service-type capacitor testers for measuring capacitance and checking internal leakage: (a) B&K 801 "Capacitor Analyst"; (b) Heathkit IT-11 capacitor checker; (c) Simpson 383A "Capacohmeter"; (d) EICO 965 "FaradOhm" bridge analyzer; (e) Sprague "Tel-Ohmike" TO-6; (f) Knight-Kit KG-670. These audio generators can be used when making frequency measurements: (a) Lafayette TE-22; (b) Heathkit IG-72; (c) RCA WA-44C; (d) EICO 378.